Johnson's Shiny Drops Kids Shampoo - 300 ml | Multicolour | Gentle and mild to the eyes as pure water. Fresh and gentle on the hair and scalp, your kid will definitely enjoy hair wash with the help of this shiny drops shampoo. 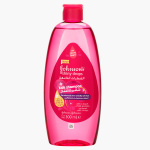 It is formulated to lend silky soft hair while gently cleansing the scalp. Feature 2 : Leaves your baby’s hair smelling fresh and looking soft & shiny. Feature 1 : Gentle and mild to the eyes as pure water. Feature 3 : No more tear formula.